A couple weeks ago, I did an extremely casual Instagram story with one of my dogs on my lap the entire time as I listed, showed, and described my tried-and-true means to de-dogifying my home using non-toxic, clean products and means. While I’m 100% aware mostly people watched the story captivated by my Jack Russell, Fred, half-asleep while sitting up as I prattled on and on, a handful of people did reach out with interest about a future blog post with links and the like, seeing as how my 2-minute video disappeared after 24 hours. Thusly, here you go - my fairly extended and very specific counsel for the best sprays, oils, candles, and products to use in de-dogifying your space without the use of cloying, toxic chemicals and vile poisons. Enjoy! And please share your stories with us when you’ve tried some of these on your own! Beeswax candles are actually healthy for you and your pets. Amazing, right? Beeswax produces negative ions when burned, and those ions in turn neutralize pollutants in the air, helping to eliminate dust, odors, dander, and mold in the atmosphere and improving breathing for everyone in the vicinity. They also last pretty much forever and a day. Read more about it here. Soy candles are clean-burning and non-toxic, as well as derived from a renewable source. Since paraffin is petroleum-based, it emits alkans, alkenes and toluene when burning, all of which have been reported to have harmful effects on humans (though there are arguments the emissions are so minuscule humans aren’t affected, we reckon it’s better safe than sorry!). Also, soy burns longer than paraffin, so win/win! I’m certifiably obsessed with the Contents Co. soy candles, especially Salvia and Cedrus, which are hand-poured in South Carolina and available to purchase right here at Nahcotta. Le Labo makes an incredible soy candle (their Palo Santo is OMGGG good). Diptyque is spendy, albeit unquestionably, resplendent. And don’t be afraid to support some of the substantially smaller entrepreneurs like this company and this one. Given that dogs have 300 million olfactory receptors versus our mere 6 million, it’s a safe given to assume that dogs can smell a HELLUVA lot better than any of us can. Consequently, their sensitivity to odors and scents is decidedly more powerful than anything we’re capable of, and scents therefore have a considerable impact on your pooch’s health. And so, while diffusing essential oils is an amazing means to refreshing your space and keeping it free of airborne germs and bacteria, there are some essential oils that are no bueno for your fur babe. Here’s a short, but vital, list! 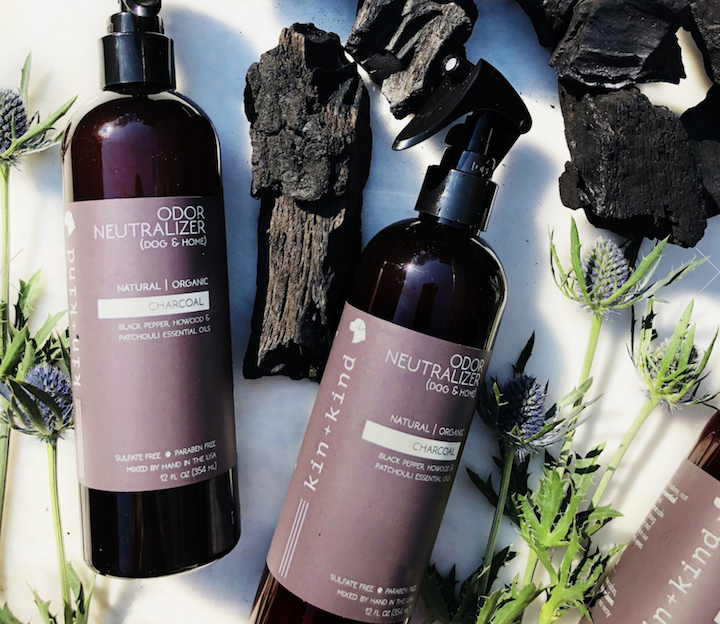 Kin + Kind Odor Neutralizer (Dog & Home) - Available in three scents (Charcoal, Lavender, and Bergamot), this concoction is basically just water and essential oils (along with a few other bits) and it is CRAZY effective at eliminating pet odors and refreshing the heck out of room/sofa/Persian rug/dog bed/you name it. Clean + Green Pet Stain + Odor Remover + Deodorizer - I don’t even remember how I came across this magical solution, but it truly removes any and all odors, leaving nothing behind. No scent whatsoever. It’s like scent sorcery, I’m telling you. In addition to buying pet beds that have removable covers for washing (like these from Animals Matter or this beaut from Backup Design), which is a heck of a lot better for the environment than tossing those cheap beds once they’ve reached the point-of-no-return stink saturation, as well as removing animal fur from your furniture as often as possible (though I’ve not personally used this tool described as a “glorified pumice stone”, I’ve heard it highly recommended from fellow dog parents), I’ve got one final tip! If you’re anything like me, you’ve got a few half-empty perfumes kicking around on your vanity. Some of these are scents I still adore but have moved onto something new and since they can turn over time, it’s best to use up these parfums in creative ways! Spritz them on your bed linens and mist throughout your home. There’s nothing wrong with a bit of D.S. & Durga’s DEBASER dominating your space, am I right? Feel free to reach out to us with your own tips, fellow animal lovers (give us a shout at rebecca@lilyspindle.com or debra@lilyspindle.com)! We’d love to hear your advice on products, methods, tools, and doodads helping to beat back the inevitable pet malodor.